As lunch time arrives so do Gino and Mel; the loveable co-presenters who fill you full of smiles and yummy food. The Let’s Do Lunch competition is of the same calibre as the massively popular Loose Women comp, although Let’s Do Lunch is a shorter, summertime TV programme! 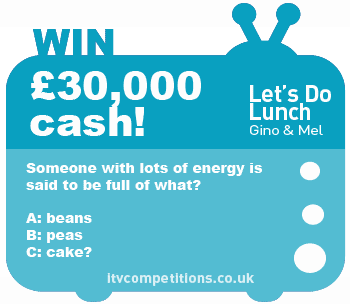 In a similar format to the other shows, the Lets Do Lunch competition requires that you watch the show in order to hear the question, then you can enter by phone, text or online. Simply visit the post above for the full competition information including competition question, answer, closing date & link to the entry page. we’ll update it every time we find a new competition! There is always the option to enter the Lets Do Lunch competition online at itv.com – we recommend you do this & it is the reason this site was setup; to help you find the direct link to the competition you are looking for. You can ofcourse enter by telephone or tex but this will cost you more than £1.50 so we don’t advise it. Another tip not everyone knows is that you can often enter the itv competitions more than once (at the moment most competitions allow 6 entries per phone number), so why not spend an extra 20 seconds entering a few times & increasing your chances of a win? OK, so if you didn’t know about the competition now you do! But what about the show? In the usual itv style, the Gino and Mel show is light hearted and often brings about a giggle. Everyone seems to love Gino; ladies, men, dogs & cats alike….he’s a funny yet talented character. And if you pay attention you might just learn something! Lets Do Lunch is full of cookery tips; from the correct use of utensils to the best methods for doing really difficult stuff – like poached eggs ; ) I still can’t manage them : ( And there’s usually a bit of banter when Gino is challenged to some cookery-related task, which often seems ridiculous, but is hilarious to watch (could be even funnier if Mel tried it sometime!). 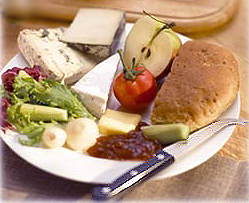 This is an example of a typical Lets Do Lunch competition question – they are always food-themed & very easy!